This piece is representative of this season’s latest fashion trends. 3. If you want to cancel the orders, please contact us in 24 hours. Once we confirm the shipment, it shows that the goods had been handed over to logistics company, we will no longer accept cancel order request. Any questions pls kindly contact with us.Fast shipping with tracking number via USPS shipping service, 7-15 business days for delivery! 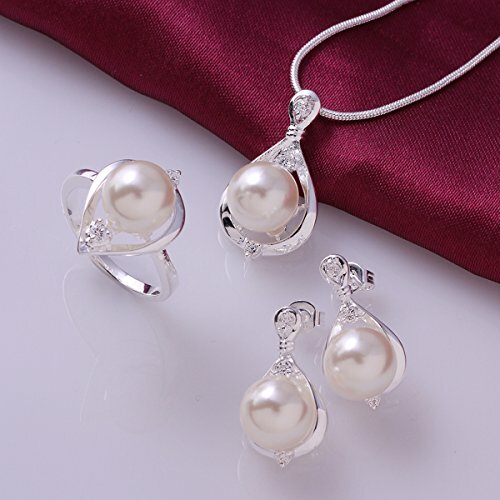 This jewelry set has applied the pearl element which add more vintage elegance.The image may show slight differences to the actual jewelry set. Allergy free. Ideal gift to someone special. Indispensable accessories for fashion ladies. Unique design suit for most costume and match most occasions like wedding, parties, anniversaries or celebrations. Top quality and Stylish.